Some friends had recommended that we go to Takayama and “eat as much Hida Beef as you can” while there. But what is Hida beef? 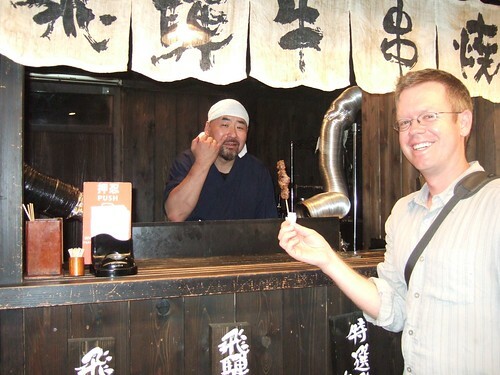 Everyone knows about Kobe beef, but who outside of Japan has heard of Hida Beef? It’s a variety of Wagyu obscure enough that it doesn’t even have a Wikipedia page. It turns out it’s yet another subset of the famous Wagyu, native to the mountains in the region of Hida, where Takayama sits. It was…just OK. J had the same thing, and we realized that the problem wasn’t the beef itself (tender, flavorful). It was that we were eating half-inch-thick chunks of raw meat, and the soup itself wasn’t quite hot enough to cook ‘em. Not the best experience.But we didn’t give up; would a bit of undercooked cow have stopped Hannibal from crossing the Alps? It didn’t stop us, either. 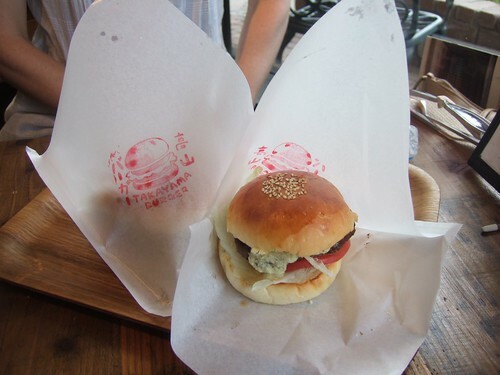 Our next experience was with a Takayama burger, and it was tiny. The burger was on a little brioche-like bun, and was maybe a bit bigger than a McDonald’s Quarter Pounder (I haven’t eaten one in years, but I do recall the size), or maybe the same meat content as a Double-Double from your neighborhood In n’ Out. It was phenomenal. Wonderful. It probably helped that we were starving when we got to it (it was a 3 pm lunch), but…still. 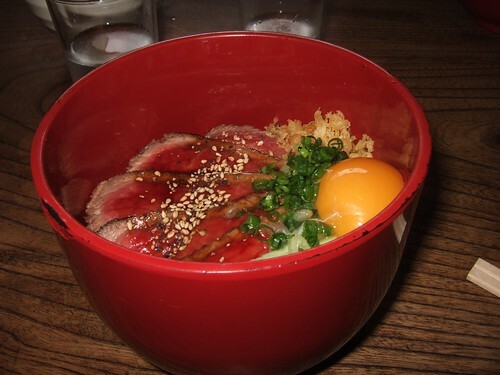 If you’re going to make a burger out of wonderful grass-fed local Sake-rubbed beef…it should taste like this. But it wasn’t my fave bite of the local stuff. That came late at night from a curbside grill…but I should break it down a little. Everything in Takayama was closed by about six o’clock in the evening. The town is a major tourist destination, and most people come in for the day, hang out, buy stuff, and leave. Lunch is big. Dinner, less so. We found a couple of places and had a serviceable plate o’ beef and noodles at one; we were on the verge of calling it a night until we passed by the grill window. I have a weakness for things grilled or fried on the street. One time in Thailand while on the way to dinner we passed by a guy dipping chicken legs into bubbling fat using a propane tank and a hand-pulled cart. After a block, I ran back, paid the guy fifty cents, and snarfed down what I still remember as the best chicken leg I’ve ever had. So, when we walked back to the same corner as the soup restaurant, I stopped and stared at their street-facing grill window. I sighed, pulled out some change, and fed some money into the ticket vending machine next to the window (Protip – if there’s a vending machine near anything you want in Japan, use it. Guys who cook don’t ever handle money) and got one beef skewer. The guy behind the grill pulled out a perfect, tiny kebab of meat, salted the bejesus out of it, and threw it on the grill. Hida beef. When cooked, it’s as good as anything in the world.